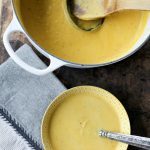 One Pot Butternut Squash Soup can be made in less than thirty minutes and tastes like soup you order in a high end restaurant. The butternut squash is cooked in the pot, along with apples and onions to make this simple soup rich and flavorful and perfect for your holiday table. Do you serve soup with your Thanksgiving and Christmas meal? If you are considering serving soup, but are concerned about the amount of time it will take, this is the recipe for you! I’m all for simplifying holiday meals without compromising quality and taste. One Pot Butternut Squash and Apple Soup is unbelievably easy to make. Its also rich and creamy, without being too filling. The base of the soup is made with chicken or vegetable broth and a little bit of half and half or coconut milk. The squash and apple pair beautifully to create a slightly sweet flavor. No other sweeteners needed! Many butternut squash soups are seasoned with curry, but I wanted to keep this simple and fresh tasting, so the only seasonings are salt and pepper. I added a couple of cloves of fresh garlic, minced and sautéed for added depth and flavor. I believe the reason why people love this soup is because it wasn’t overly sweet or strongly seasoned. Making a smooth soup is simple if you have the right tools. After all of the veggies are cooked and broth added, I get out my immersion blender and pulse a few times before blending for about a minute, or less. I cannot tell you how many times a week I pull out this kitchen tool. I made a few batches of this soup last month to feed a crowd. When making the soup, let it cool and then pour into containers and store refrigerated until ready to serve. It keeps for at least 2-3 days in the fridge. When ready to serve, simply heat up on the stove and get out your ladle. I like the idea of drizzling the finished soup with a bit of cream and adding a few sunflower seeds or pumpkin seeds for garnish. For a holiday meal, if you are serving lots of other dishes, a small cup of One Pot Butternut Squash and Pumpkin Soup ( about 4-8 oz) would be perfect at each place setting just before everyone sits down. It will add a beautiful bit of color to your holiday table! Place oil and butter in a large pan over medium high heat. Add squash, salt and pepper and saute for about 5 minutes, uncovered. Add garlic, chopped apple, onion and saute for 5 additional minutes. Add about 2 cups of broth and bring to a boil. Cover and cook for about 10 minutes or until squash is fork tender. Add remaining 2 cups broth and bring to a boil. Reduce heat to medium. Using an immersion blender, blend until smooth, or add soup in small batches to a blender. Add half and half. Simmer until ready to serve. I made this delicious soup the other day with squash from our garden we’ve been trying to use up and it was wonderful. I think I ate it all by myself. I was a little confused by the wording on the salt and pepper though. 2 tsp of each one? That seems like an awful lot of pepper. Split the 2 tsp? Can you clarify? Thanks so much! Brooke, Sorry about the confusion, 1 teaspoon of each, to taste. Some batches I add a bit more salt. Yes, I just edited thanks for the heads up! There is a total of 4 cups or 32 oz of broth in this recipe. Thank you! Hi Si – can frozen butternut squash be used in this recipe? Thanks! When you say add the butternut squash to a pan, does that mean already cooked and off the rind? If so, what is the best method for this. I want to make this on Sat. No, peeled and seeded butternut squash, the squash will cook in the pan. It is added to the pan before cooking. Really simple to make. 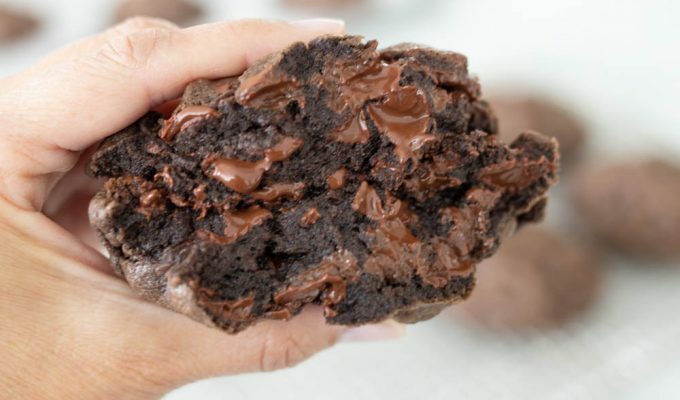 I think you’ll love this recipe!